I’m not sure how it’s possible, but it’s already mid-summer! They say time flies when you’re having fun and I can’t think of anything more fun than spending my days surrounded by books and by people that love them like I do. Did you know that there are 460 owls in the Butler Center collection? Part of a generous donation by the estate of librarian and literacy champion, Effie Lee Morris, they represent the importance of the wisdom of the child in the consideration of books for young people. Our collection is currently being cataloged for research and preservation by Steven Szegedi, Dominican University archivist. Feel free to stop by and visit our parliament of Butler owls any time! I was fortunate to attend the American Library Association annual conference in New Orleans in June. With millions of books to see and what felt like millions of people to see them (ok – maybe it was closer to 20,000), it was quite an event! I heard some amazing and inspiring speakers, collected more books than I could reasonably carry home, and got the chance to meet and thank many of the generous publishers that contribute to the Butler Center’s review collection. Check out the Butler’s Pantry for a recap of the weekend and some photos of the event. Is there an event you’ve always wanted to see the Butler Center host? Do you have a professional development interest you’d love to share with local librarians and teachers? We are in the midst of fall program planning and want to hear from you! What types of events would you love to attend in the Butler Center? When would you love to attend them? We would love to hear your ideas. Your input helps build a stronger BCLC community! Please drop us a note at butler@dom.edu. 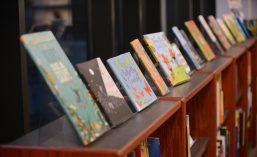 The Butler Center welcomes teachers, librarians, booksellers, parents, grandparents, caregivers and anyone interested in literature for young people. Beginning August 27th, the Butler Center will be open Monday – Thursday from noon-4 p.m., or by appointment with the curator; contact butler@dom.edu to make special arrangements. The Center is a non-lending library but our staff is here to assist you in locating books that address specific themes, age groups, or reading levels. The Butler Center is located in the Rebecca Crown Library, room 214, on Dominican’s main campus at 7900 W. Division Street in River Forest, Illinois. Directions and a campus map are available here. The Butler Center is administered by Dominican’s School of Information Studies and is generously supported by the Butler Family Foundation. We hope you’ll want to visit us, or join us for an event, and stay tuned for our news and upcoming events. Please contact me with any questions you have. I look forward to seeing you soon!